It's not your daddy's reich anymore. When visiting Germany I continue to be amazed to see more Turkish flags flying than German flags. 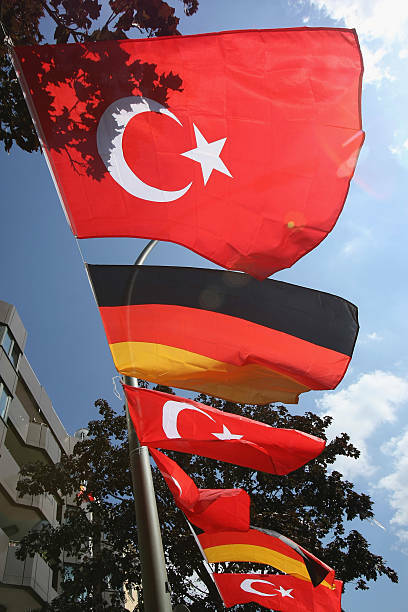 In some areas of Germany the ethnic Turks far out number the Germans. And by this I am not addressing the nearly one million unemployed military age Muslim males from Syria that Germany welcomed into its borders. Being part Swiss and part German with family from both places who were part of my growing up, I do get the Germans. And they mystify me at the same time (collectively). Individually, Germans think like who they are, and I like them and enjoy spending time in Germany. Some of the best Turkish food I've ever eaten was served in Germany. They invited in a lot of guest workers from Turkey over the years who stayed and joined the culture in a weird way. Interestingly enough, Russians (modern Russian Federation types) are more conservative when taken as a whole than the Germans are. The Germans are socialists by in large. Some are International Socialists, some are National Socialists, some are another brand of Confused Socialists (my term, not theirs), but they're leftist/nihlists who aren't sure about what they want. Russians don't tolerate Muslim minorities in Russia these days. They give them the bum's rush to the border and invite them to return from the fetid desert that they sprang from. Germany has taken the opposite approach and while I don't understand it, they rolled in the dung of military age Muslim males, still unemployed, and seem to want to keep them. Germany is our ally sorta - Russia is our enemy sorta. We send troops to defend Germany, we send troops, ostensibly to fight Russia. Don't look for reason in American foreign policy. Even the Trump Administration refuses to brand the confiscation of land in South Africa based on race to be "racist". This is a serious survey. Not an Internet troll or one of those clickbait sorts of trolls with an eye toward increasing a hit count on a blog. I'm very curious which of the following rifles you all feel is the best all around daily carry rifle for a ranch rifle. I define the ranch rifle as one that is flexible, functional and useable for every day use. Price is of secondary importance, and quite honestly, is of no real importance. Function and reliability over cost. The Rec 7 is available in 5.56 NATO or 6.8 REM. If you select this as the best ranch rifle, please also specify a preferred caliber. The sight options that can be applied to this rifle because of the rail system and the weapon in general are almost endless. You may have smaller "gas gun" platforms that you prefer to the Barrett Rec 7, because of price, but this is the one I would like you to consider for the sake of this survey. The LRP-07 was designed as a .308 platform to cure the shortcomings of existing rifles and still handle like an AR-15. The felt recoil impulse on the LRP-07™ is also nothing short of amazing as it was designed from the magazine well up to use our Low Mass Operating System (LMOS™). In this case, the LRP-07 mounts a Schmidt and Bender PM 2 scope (5-25). While this is a superior rifle for shooting and for longer range shots in particular with a .308 cartridge, it's not a rifle that I'm comfortable knocking around - so while I have it as an option, there is the general reluctance to treat it in the rugged way that a "camp rifle" sometimes is treated. I simply threw it into the list for consideration because it is available. The Marlin lever action in .45-70 throws a heavy round downrange, is exceptionally rugged and is presently equipped with open sights, though just about any sighting configuration is mountable. The venerable bolt action Remington Model 700 in .270 is flexible, durable and with a Schmidt and Bender PM 2 scope (5-25) it has the capacity to hit whatever you're aiming at to the capacity of the cartridge and loads you are carrying, in much as the same way the JP LRP-07 has. It lacks the rough and ready characteristics of the Marlin lever action but it's exceptionally rugged. As with the LRP-07, I consider it more of a hunting rifle than a 'ranch rifle' but there is nothing keeping the rifle from doing double duty. As a battle rifle, there are few that can match the M-1A. (ok, throw up your arguments) I know that there are a few people who follow this blog from time to time who own M-1A rifles. I left it for last because in many ways, it combines the best features of many of the rifles that I have available to me. It's rugged to a fault, the .308/7.76 NATO round is effective beyond the range of the 5.56 (but not the 6.8) -- but when we're talking ranch rifle, we're not really considering shots at over about 300 meters. The M-1A with open sights is lethal in that range profile. It's not competing for the purposes of this survey with the capacity to reach out in the 800 meter (cartridge capacity) range profile. So there you have it. Daily carry in the rig, general use options. Or if you have other favorites, mention them. I haven't mentioned ammunition. Suffice, that in the military cartridge options, I don't expect that I will ever need to buy more ammo through the course of my life. So while that should not be a limiting factor, it's something that I think about.